The purpose of this organization shall be to maintain an association of persons interested in strengthening and supporting the interests of the Hoag Library, enhancing and promoting its usefulness as a community library whose service area is comprised of the four central towns of Orleans County – Albion, Barre, Carlton and Gaines. The Friends are now a not-for-profit organization. 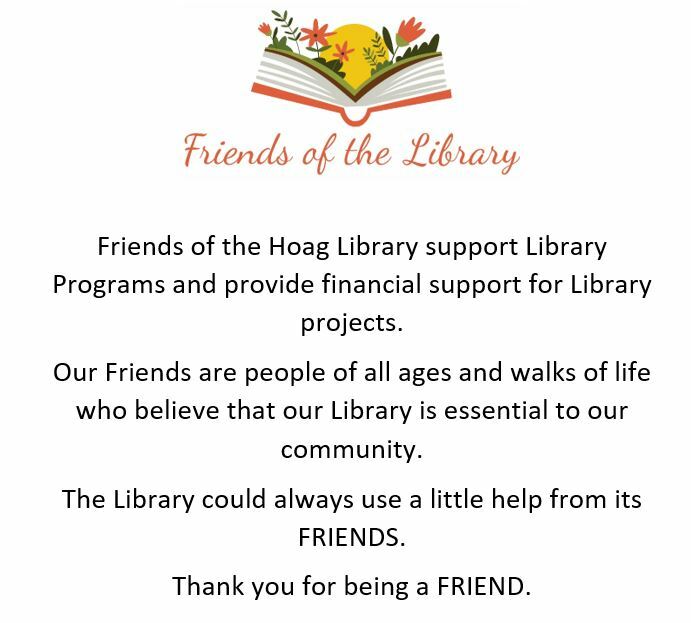 Donations to the Friends of Hoag Library are tax deductible. Volunteers are always needed! Please call the library to see if there are any upcoming events you could help out at! The Friends support several programs throughout the year that benefit Hoag Library. These programs help with Summer Reading and/or anything that the Library needs outside the budget. Members of the Friends have only one goal to help the Library in any capacity that needs their assistance. The Friends help keep the library a friend to the community. 1st Tuesday of every month at 6 p.m.
Return your bottles and cans to the Albion Redemption Center and ask that your refund be donated to the Friends of Hoag Library. Thank you for your support!